The average coal plant burns approximately 200 coal cars a day, with 100 tons per car. This makes 73,000 cars per year, or 7,300,000 tons per year. The average nuclear plant uses about 0.005 of a rail car of fuel per day. 20 tons per year. 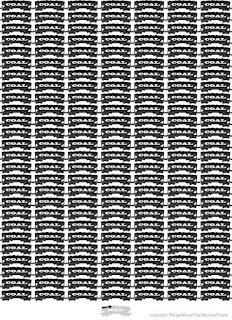 Since it's really tough to compare 7,300,000 tons to 20 tons, here's a chart of how many cars that is per day. 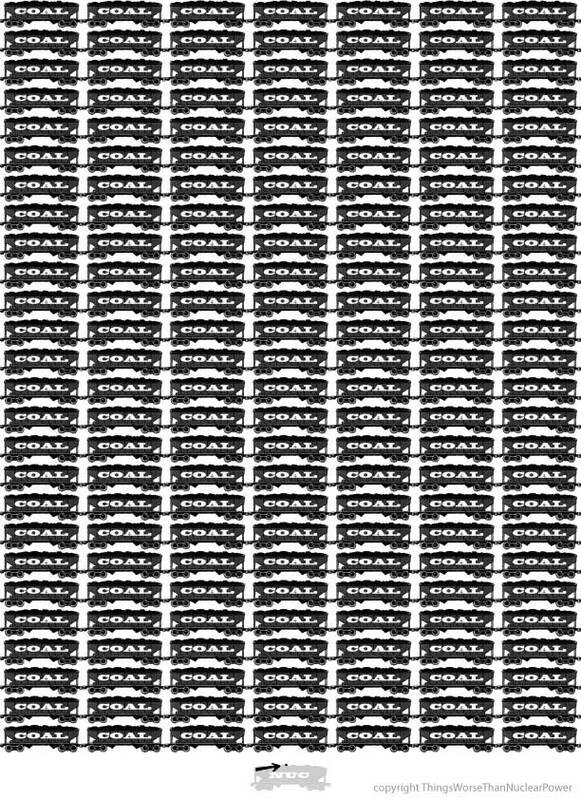 That is 200 cars to 0.005 cars. Since 0.005 of a rail car is also hard to be exact on, let's just imagine it is the speck drawn on the below car (it's actually smaller than that speck). Next, think about this. alllll that coal waste, where is it going? Into your air and environment. In the U.S. alone, coal power plants produce 130 million tons of fly ash waste and 1.98 billion tons of CO2 each year. Where's the used nuclear fuel? All of it is stored on the nuclear site, in secure containers. The final kicker? Used nuclear fuel still contains an immense amount of energy--over 95% of the potential energy contained in that small amount of material is not even used. Advanced reactors will one day be routinely used to recycle this waste. Great info-graphic, but you need to add the word "Globally," before the fly ash sentence. Switching between per plant numbers and global totals will confuse people. Good point on specifying- the numbers are actually for the U.S. Thanks and hope the graphic is useful to point others toward when talking about waste and putting it all in perspective. Ah ... many thanks. If I'd thought about the CO2 figure more, I should have guessed they were US figures. Thank you for this excellent graphic and in fact for this excellent blog. "Of the total number counted by BDEW, 23 units were to be driven by offshore wind, 10 were pumped storage plants, 29 gas-fired and 17 coal-fired generation plants, it said." I totally support your brave new online direction. I am confident that I will be inserting many more links to Know More Fear Less than I currently do to Brave New Climate because the content (an absolutely invaluable resource), and the reason for it, will be more obvious to my readers. Suggestion: Allow readers of Know More Fear Less to post editorial comments that will be seen by the editor only. Readers of the Mahurangi Magazine have that option and most of the comments I receive are either about the occasional typo, or are a simple, personal, thumbs-up! This is actually Things Worse Than Nuclear Power, not Know More Fear Less, although Brave New Climate (completely separate from us) is creating the new website to mimic our style- simple and easy to understand facts contextualizing nuclear energy. More power to them! While KMFL is still under development, I am glad this will be a resource to you! Ciao Caroline, Looks as though Barry might have seen my thumbs-up, despite my confusion! Great work, by the way. Caroline, thanks for the excellent work on this - I hope our two sites (TWTNP and KMFL) can end up working well in synergy and sharing resources - as you say, we need more people trying new forms of communication on this critical issue. Absolutely. Looking forward to checking it out! Thanks Barry. Good information. Sadly, the reluctance of governments to adopt next-generation nuclear power, instead pursuing not-yet-mature solar and wind solutions (which do have their uses, but large-scale power generation is not yet in the cards for them). Imagine our surprise when our only recourse is "cheap" coal. What is the volume of 20 tons of uranium? It’s very heavy so it’s actually less than you’d imagine, then re-do the math on only 5% of it actually needing to be stored. Then invoke the holy term “recycle” and ask why we’re not recycling it since it’s 95% good. So what, about 900kg needs actually be stored if we had followed through on our reprocessing? How big is that? nice research done on this problem.. government should take preventive measures if not, we the people are doomed !! Imagine the extra transport and transport infrastructure that is necessary for the fuel transport, and later for the ashes. That is the reason that the real efficiency of nuclear is greater that one normally considers. The only transport in nuclear is the power by the powerlines and once in 2 years a train with castor containers to a fuelrecycling end reprocessing plant. It saves probably hundredths of traffic fatalities in the lifetime of a single nuclear power-plant besides of the tens of miners lives. We "store " the waste of the coal fired plants in the atmosphere as dust and CO2 and the poisonous heavy metals in it (arsenic,cadmium uranium and RA daughters dust , some with "eternal" half-time) in landfills. Not like the few insoluble glass like waste-rods from NPP's , that are stored 100 meters or more beneath our feet and decay in 1000 years to lower RA and stable minerals. If fast reactors would be build (Existing technology) even transuranic s ( Am,Pu,Es,Np,Ca) are burned while producing power leaving only those elements with half-times shorter than a couple of hundred years or less for the waste glass rods. Nice, but I would have been happier if you had included amount of natural uranium required to make this happen, I believe that would be a fairer comparison. You give the average amount of fuel used up by a coal power plant and a nuclear power plant. Can we also have the average power output from a power plant? I would think that it's important to compare power sources mW for mW as well.